Then I woke up again. But this time it was still dark and worst of all, it was still Friday! It was all a dream! It's funny how things like that can put you in a bad mood for the day so this evening I cheered myself up by starting my Ballerina for real! I started by marking out and cutting templates for the formers on paper transfer tape. This is very similar to masking tape but comes on a big roll 8" wide. 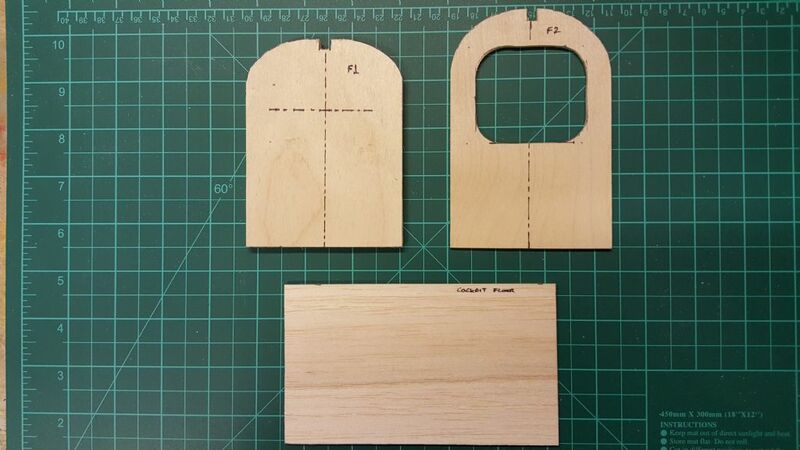 These were transferred to a ply sheet and 1/8th balsa rectangles already cut out. My bad mood briefly returned when I sheared the screw off whilst tightening the blade grip on my scroll saw, leaving the remaining thread deep in the metal grip! Not really feeling like cutting the couple of ply parts with a coping saw I set about removing the grip ready to drill the broken thread and extract it with a stud extractor. My bad mood disappeared immediately when the drill bit started cutting but then gripped the thread and wound it straight out for me! 5 minutes later it was all back together ready to start cutting again. Must be a good omen? So after an hour or so of cutting and sanding on the bench sander I have a pile of formers ready. Unfortunately I didn't have enough full lengths of 3/32 to cut the fuselage sides so they're on hold pending a shopping trip in the morning. 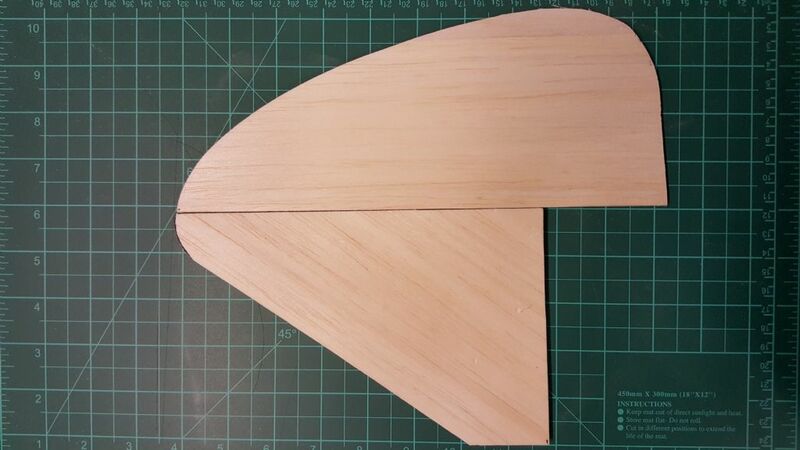 Finding a single length of medium 1/4 I cut and jointed the parts for the fin and rudder. No fancy built up framing for this Ballerina. Then onto the fun part, the wing ribs! 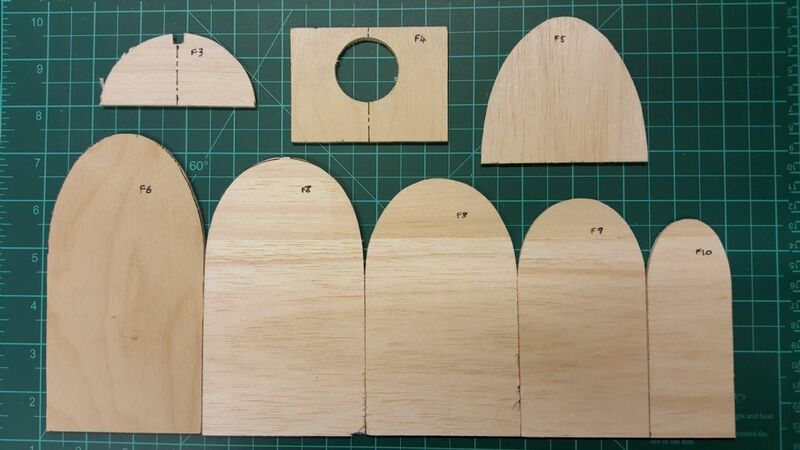 I started by making a template in ply which is basically the same for all the ribs except the tips. I then started cutting the ribs, marking them as I went to keep track of what I had cut and what was left. A lack of 1/8 lite ply meant I couldn't complete the set and that's on the shopping list for tomorrow as well! More progress tomorrow and hopefully this good mood will continue! Looks a good start to say the least. I have cheated and have gone for the CNC pack. I like your idea of paper transfer tape, have not heard of this before. Where do you get hold of this? I have used opaque grease proof paper in the past, redirected from the kitchen, but Tesco have changed the spec to brown which cannot be used (except for cooking of course!). Subscribed & impressed by your build speed. I see another one has fallen for the "grain across the formers". I should put a stip of balsa up each former to stop it falling in half. I really must indicate the grain direction on the plan. The draughtsman has obvioulsy never built a model or he would not show the grain across the former. I see you have retained the original wing dowel position in R1 Chris? One of the other Ballerina builders (can't recall whom sorry) has re-drawn R1 with the wing dowel moved up 1/4 of an inch, as the plan showed it rather close to the bottom of F2. The mod ought to give the dowel more hold/security. It's a straightforward mod in that the top edge of the current dowel position in R1 becomes the lower edge of the new position, if you get my drift. The dowel position in F2 simply moves 1/4 higher. My original had the dowel higher and the hole in the former higher. I don't soppuse it will make much difference but it is a little stronger when the hole is not quite so close to the bottom of the former. Don't ask why. I think the final draughtsman likes to think he has added his onw personal touch or something. I,C version, what's going up front Chris ? looking good,i hate wings,proberly why my se5 unfinished in the loft. Wow I'm slow sometimes! I've only just got that! Very good! I'm glad someone got it BEB, I'm using all my best material here. I got some from Green Stik Crafts where I also get the vinyl rolls for my cutter. It's mainly used for car decals and sign writing to transfer the letters from the backing sheet then onto the vehicle. Yep! I spotted that and pondered for a while why it was across the fuselage. 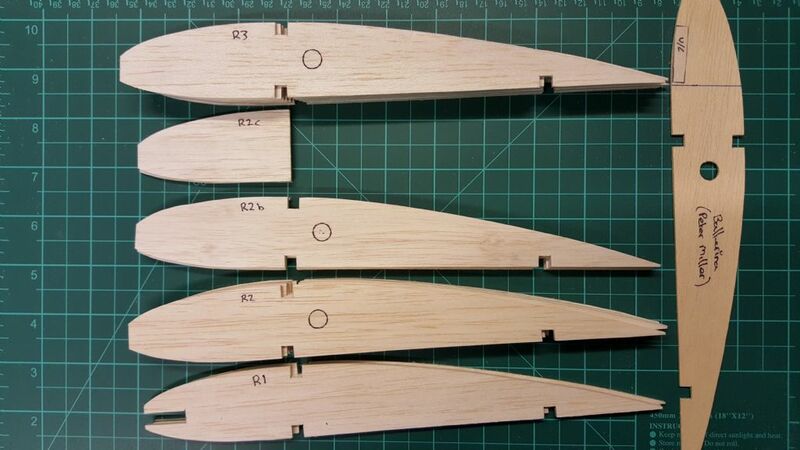 I can see how it could possibly split across at the top of the fuselage sides but with the stringers glued in properly and F6 made in ply I doubt splitting will be an issue once the fuse is together. It did mean that I could use up a load of 30mm strips from the scrap drawer though! I do intend to change F10 though as any excessive twisting forces on the fin could possibly shear that former along the grain. When I was marking out R1 I didn't think it was unduly low in the wing but having now cut the fuselage sides I see that the wing sits really low and the dowel would be right at the bottom of the fuselage. A good yank on the up stick and the fuse and wing may part company! I am going to fit the dowel much higher up in the wing going through a ply plate housed in the leading edge and filleted to the top skin of the wing. This way the dowel will be around 15-18mm into the former. So glad I didn't say I woke up feeling grumpy then! That's terrible John! Yep staying i.c with an ASP .52 FS so it will make nice noises! The ASP isn't a vast amount more power than a good OS .40 FS ! Went shopping today and got everything I needed except 1/32 ply and 1/4 sheet, so basically all I have been able to do is cut the fuselage sides for now! I did however manage to get everything I needed for my PSS Vulcan so made a start on that instead! Regarding using the transfer tape to copy templates from the drawing I should add that the plan is covered with clear plastic and the transfer tape applied to that, NOT directly to the paper plan! It is very low tack but I would think it'll still tear the paper. You're liking the slope soarers then ? must admit if it wasn't for the driving, I could see myself enjoying it. I find "normal" sloping quite challenging and great practice for cross wind flying that can be applied to powered flying. Good windy days are very exhilarating and TBH flying off something like the East side of the Orme directly over the sea is terrifying, but awesome at the same time! The PSS flying is all the above with model jets, fighters, bombers, airliners, just about anything you wouldn't want to put a screaming EDF in or an expensive turbine! But it's still not like landing a scale bipe on short grass just above walking pace!